Goodness, TK and I had a fabulous and relaxing weekend and I feel ready to conquer the week! We probably should have done a little less movie-watching and a little more cleaning, but at this point I don’t really care. I know tomorrow is going to be crazy (the life of a journalist on Election Day) so I’m glad I got some relaxing in when I could. 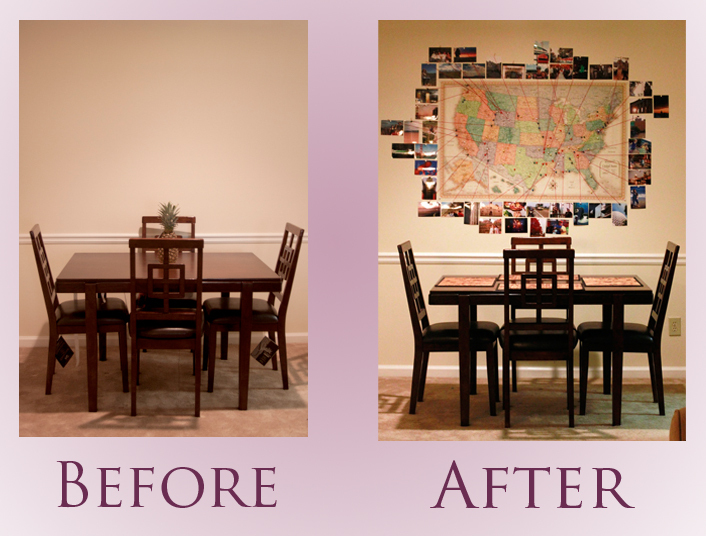 A while ago I promised to show off some DIY projects I’ve been working on, so today I wanted to show you all my wonderful dining room decor! This is a project I envisioned a long time ago. 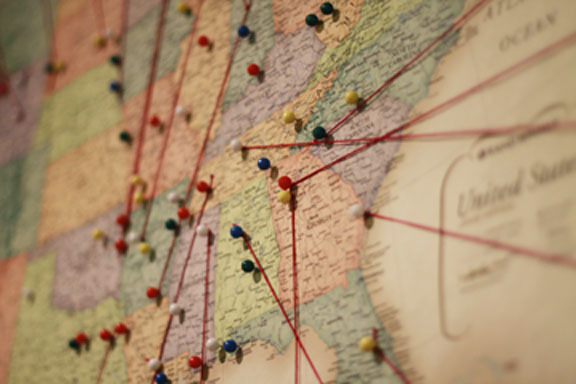 I wanted to put up a map with pins at various locations TK and I have visited. Then, I wanted photos around the map showing different memories at the different locations. All sorts of memories on that map! TK and I had a blast doing this together. 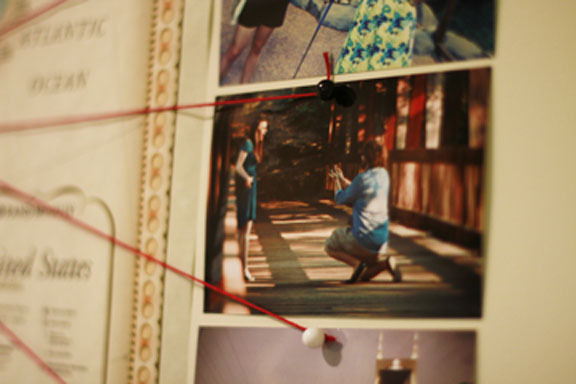 We picked out photos and took turns pinning them up, connecting the locations to the memories with a piece of string. It took a while but I think it turned out to be a fantastic addition to our little apartment. One great thing about this project is having a visual representation of how blessed we’ve been to meet so many people in so many different places. A lot of that traveling happened while on staff with World Changers and Power Plant, and we are so thankful for all those relationships. One Georgia pin leads to a photo of TK proposing courtesy of Susan Whitley! Right now the map is a combination of places TK has been, places I have been and places we’ve been together, but it will hopefully evolve into a complete map of places we’ve traveled to together. Maybe we’ll even expand to a world map someday! How do you display your memories? Ginger, honey, cashews ... mmm! Happy [pumpkin-spice-cupcake] birthday to you! "Jesus literally died of a broken heart so you could have a better story." This is my story...I'm losing it for Jesus. Christian. Husband. Father. Youth Minister. let me continue in peace, and (stop) wander(ing)!